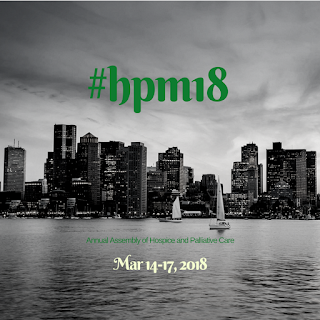 The Annual Assembly of AAHPM and HPNA is this week and if you are going to Boston, or staying home to keep things running smoothly, social media can help make your conference experience be transformative. Since 2009, the Assembly has been making use of Twitter to provide additional insight, commentary and sources for the multiple sessions each day. Now things are expanding to dedicated conference apps, Facebook and Instagram. And for the first year ever we have Twitter contests. The Pallimed Network will feature content across multiple platforms and will include the HPM chat account from Twitter. 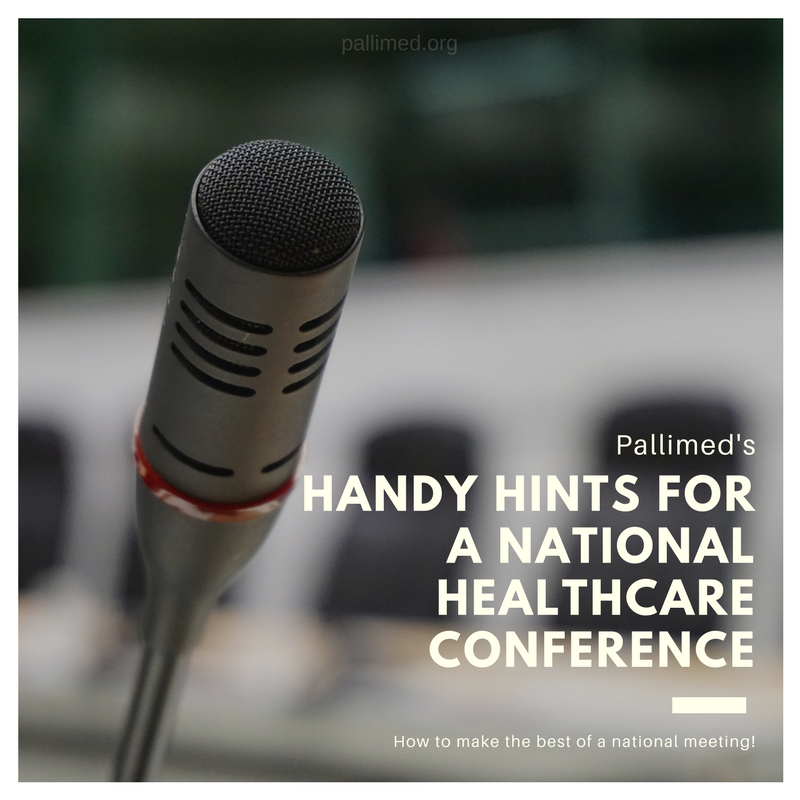 Handy Hints for Attending a National Healthcare Conference - Updated! In the early years of Pallimed, I was brand new to going to national conferences focused on healthcare. It was exciting, exhausting and at times overwhelming. I started collected little bits of wisdom I picked up from others and some I discovered myself. They were compiled into the original Handy Hints for a National Meeting back in 2005, with updates along the way. With the Annual Assembly of Hospice and Palliative Care coming up this week, I thought I should revisit them since I have not updated it since 2011. Please feel free to comment and leave thoughts from your own experience. Updated layout for before, during and after the meeting. Additional contributions by Emily Hahn, Allie Shukraft, Lori Ruder, Amy Davis, Kyle Edmonds, Sharon Hudson, Holly Yang among others! * If you are bringing family or a significant other, spend some time with them. * If you don't bring family or a significant other, leave something nice for them to discover at home while you are gone OR get something for them while you are gone. * Pack and wear comfortable shoes, you will be doing a LOT of walking! But try to be a little stylish, you don't know if you will be going out to dinner later and have no chance to get back to your hotel room. * Figure out the general dress code of the conference ahead of time, some are more formal than others. * Download the conference app, it can be very helpful! * Review the schedule before pick a back-up session, in case a session is not what you thought it would be. * Create a file for new discovery- your head will be full of inspiration which trickles out when you are back at work. * Schedule a conference review educational session for after you get back from the conference. * Find an influential blog in your field, and see if they want you to write a conference review. * If it is a conference outside the US, check your cell phone for extra costs/access BEFORE you go! * If the city is not well known to you, read up on the city on Wikipedia. You might be surprised what you learn about where you are going. * Have digital access to your UPDATED CV/resume, regardless of whether you are looking for a job. Many people may want to know more about you for networking reasons, not just job offers. * Update your public-facing social media profiles (Twitter, LinkedIN) before you go to a conference as people may be checking you out without asking you. * Connect with attendees before you go through social networks like Facebook, LinkedIn or Twitter. * Put together or join a fun GroupMe/WhatsApp/Slack/Facebook Messenger conversation to keep in touch, share reminders of sessions to see, and keep each other amused. * Reconnect with old friends. A great reason to keep coming back to the same conference! * Turn in session evaluations in a timely manner. And give some valuable feedback. Bad speakers need to know they are bad and why and what to improve. Be specific! Don't give bad speakers a 4 out of 5! * Find someone who is organizing the event and let them know they are doing an excellent job. They don't hear it enough. They are probably pretty exhausted from putting out everybody's "EMERGENCY!" They have put in a lot of hard work and seldom get recognized. * Find the conference chairs and thank them. While possibly celebrities in the field, they don't always get personal recognition for the months of work put into coordinating the activity. * Eat healthy. Grab a piece of fruit for later. * Try and get out and see the city you are in, since you never know when you will be back there or if it will be devastated by a major hurricane, flood, earthquake, killer tomato, or anarchists. * Figure out where the coffee is early. * Go outside as often as possible even if it’s inclement. * Don't stay in your hotel room too much, you'll miss too many opportunities. * Stay in your hotel room sometimes. Take some time to unwind and be yourself. * Try to ask a question in at least one session that strongly interests you. * When you ask a question, first thank the speaker, introduce who you are, and where you are from (quickly). 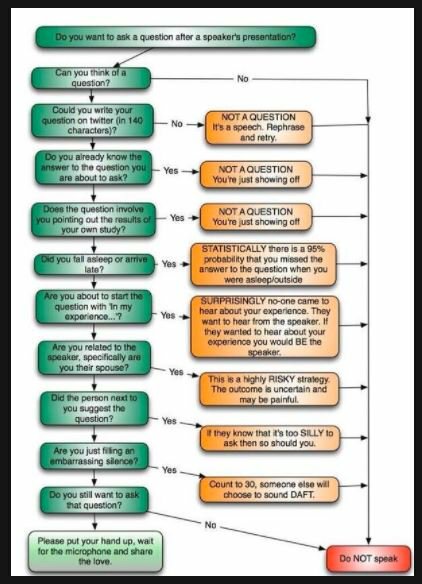 This helps calm you down if you are nervous to ask your question. It also lets the audience know if they want to talk to YOU after the session if they have similar interests. * Don't hog the mic. 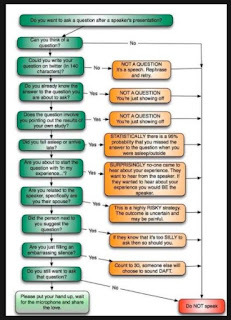 Ask your question succinctly. Other people have questions too. * Don't just depend on your notes during each session; chances are you will never look at them again. Write down key facts you have learned towards the end of the day. * Pick a method to highlight key facts or notes. Tag good notes with a star or different color pen while you are taking them. When you get back it will make it much easier to find the 'GREAT' ideas or 'ACTIONABLE' plans. Or you can Tweet the really good ones too. * Go to the poster sessions and talk to the people who made the posters. A lot of hard work went into most of these, and everyone likes to hear when they have done a job well. * Go to at least one paper session. The concurrent sessions are great but you can find out some interesting up and coming things in the paper sessions. * Go to at least one session that seems interesting but doesn’t relate to what you do - you may still learn something useful. Sometimes the best presentations are those which surprise you - take a risk with something new. * It’s okay to leave something boring. Make the most of your time at a conference. Look on Twitter and see where the action is - go there! * Ask other attendees what talks they are going to or avoiding. You may find something interesting you had previously overlooked. * After a session, if you talk with a speaker, make your point or ask your question, and then allow others to interact. Nothing is worse than the know-it-all who wants to take up all the time of the presenter without regards to other people's interest. * Do not work on the slides the night before your talk, because you should be having fun with friends and colleagues. * Don’t heckle presenters (online or in real life); we’re on the same team. * Add to your file for new discovery for yourself and for the conference review you will be giving when you get back to work. * Don't sit by yourself unless you are the first person in the room. * Sit next to someone and then introduce yourself. Then ask all about them; you will be surprised how much people enjoy talking about themselves. * Take the opportunity to meet Twitter friends for real. * There is usually a bulletin board in a central place where people post messages: Look there for any messages regarding you or get-togethers you are interested in. * If people are going out to eat or drink at the end of the day, go with them! It’s fun to make friends! * When you go out with other people, you do not HAVE to talk about your field. (The people at the table next to you may appreciate that). Make a game to see how long you can go without talking about your work. * You should make lunch/dinner plans with people outside the group you came with, but invite your group along too, if appropriate. * You don’t have to stay with the people you came with during the day, but keep in touch via text, losing people is easy. * When receiving a business card, immediately write down the topic of interest you were discussing with that person. If the time isn't right, then do it soon afterwards. When you get home, you will have met so many people, you won't remember who that person was. Opportunity lost. * If you get someone's business card, and you don't care if you ever interact with them again, make a special symbol that only you know on it, so you know to throw it out when you start going through all the business cards. Not everyone you meet is going to be a hub of a network you need. * Put something colorful or interesting but not too noticeable on your name badge. People will ask you about it and then you can tell them what it signifies. Note: Do not say, “It signifies something to get people to talk to me.” Although that would be pretty funny. * Trying to hire people? Get a custom printed bag that says "Now hiring!" with your logo or something clever that will get people to talk to you. * Do not be afraid to talk to someone you admire. * Go to the welcome reception: posters, food, and people! * See who is tweeting from the conference and strike up conversations with them and try to meet in real life. * Know what your conference policy is about posting slides and pictures. Some conferences are pretty draconian. If you decide to post them against the rules, it is good to know what is expected of you. * Everyone has ideas on how to make a conference better. If you share them with the organizers, be constructive and understand there are often several factors that influence why certain decisions were made and they are not always clear to the people attending. You don't really want to know all the details in how conferences get put together. It is tough work! * Review your file for new discovery and put ideas into action! * When you come back to work, schedule a conference review educational session to share everything you learned there. After that is done, ask to go again next year! * Get ready to submit what talk you are going to present next year. * Use the business cards you collected during the meeting to see if anyone is on LinkedIn. This makes it easy to get their latest contact info and you can toss the card since you have an updated digital version. * If you contact someone on a social network after the conference, be kind and add a little note about why you are connecting with them. They likely met a lot of people and may not remember you. And with your notes you wrote on the business card (see Networking In Real Life above), you look like you have a super memory!